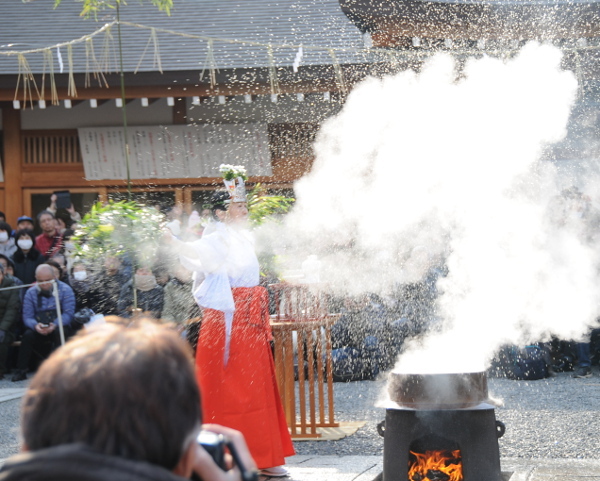 When I arrived at Jonan-gu, a large cauldron of water was already being heated over a fire, and the offerings for the gods were placed in front of the main altar. As usual, the ceremony started exactly on time, when the shrine priests arrived, followed by musicians and five miko, shrine maidens. After some initial prayers, a first purification took place – a priest waved sacred paper over his fellow priests, the shrine maidens and musicians, and finally, the spectators. 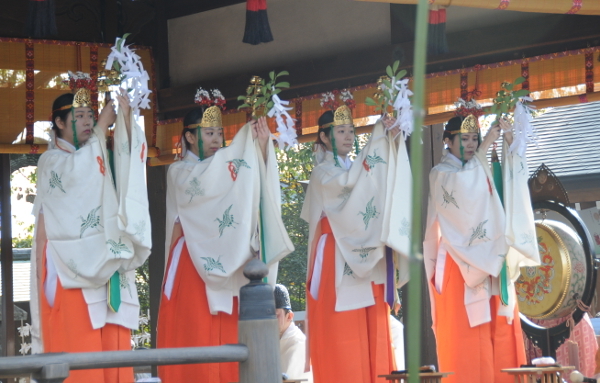 Then, four of the miko danced a sacred dance, this is done to invite the gods to the scene. Afterwards, offerings were made and prayers were said, and the gods were implored to help purify the visitors. Only now the main part of the ceremony started. The fifth and oldest miko, so far being a silent spectator only, stepped forward to the cauldron with the now boiling water, and started to add a few extra ingredients: salt, rice, and sake and thoroughly stirred the mixture with a large stick adorned with sacred paper. She then took two large bunches of bamboo leaves, soaked them in the “soup” she had just prepared, and then, with large and forceful gestures, she splashed the hot water around her, three or four times. As you can see on the picture, the water together with the smoke from the fire made quite an impressive scene! She then moved on to sprinkle the hot water over the visitors in the same way, who had to bow their heads to be purified from evil spirits and bad luck by the hot water. One final sprinkling before the main shrine, a bit more music, some more prayers – and then everything was over. 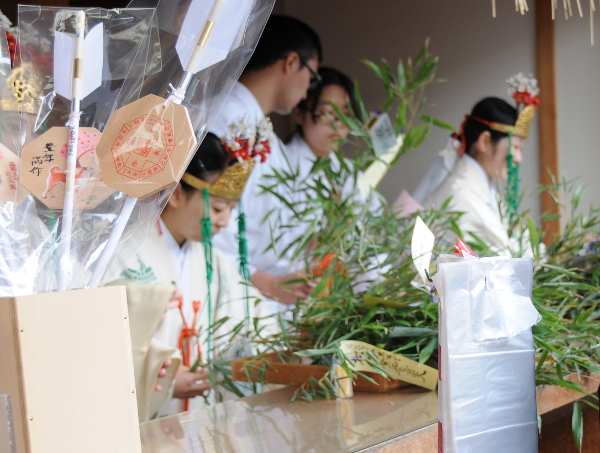 The bamboo branches that had been used in the ceremony were then sold as lucky charms to take home for a hefty 1000 yen apiece, and many of the spectators took the opportunity. A large part of them went up to the cauldron where some hot water was left to fan some of the – quite evil-smelling – steam over their heads and bodies for additional purification and blessing. 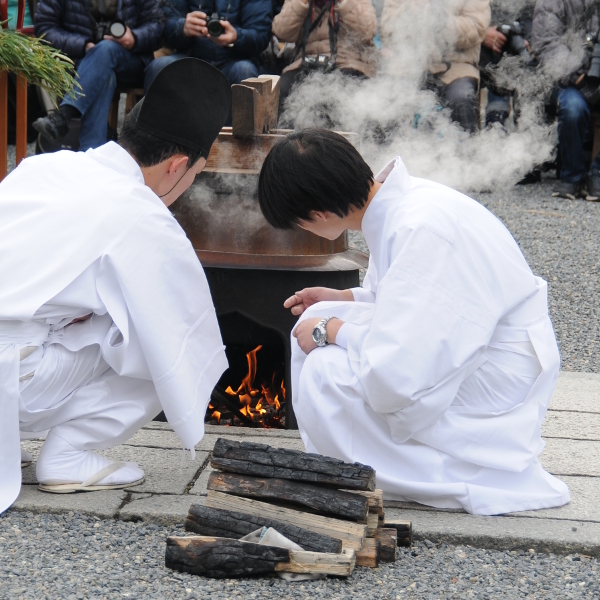 This entry was posted in All Things Japanese, religious ceremonies by Iris. Bookmark the permalink.